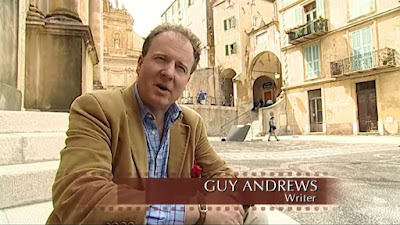 Guy Andrews wrote four scripts for Poirot: The Mystery of the Blue Train and Taken at the Flood for Series Ten (2005-2006), Appointment with Death for Series Eleven (2008), and The Labours of Hercules for Series Thirteen (2013). He is known for the mini-series Lost in Austen, Blandings and Prime Suspect 5: Errors of Judgement. The first two demonstrates that he is entrusted with adapting other literary classics (Jane Austen and P. G. Woodehouse), and in Lost in Austen I'd say he succeeds, at least within its genre of television. Prime Suspect, the award-winning and exceptional series starring Helen Mirren, proves that he masters the crime genre, and his episode is actually rather good (Prime Suspect 5 won and Emmy for Outstanding Miniseries). I have a very conflicted view of Guy Andrews screenwriting abilities on Poirot, as my episode-by-episode reviews can testify to. The quotation above sums up his approach to the source material - 'monstrous liabilities'. Appointment with Death is easily my least favourite Poirot episode (or at least it would have been if it hadn't been saved by an excellent soundtrack, location and production design). Taken at the Flood is passable, but the whole point of the title and the murder is lost in transition from page to screen. The Mystery of the Blue Train is, again, simply saved by great actors and a beautiful location. Only The Labours of Hercules manages to succeed, and I think that's simply because 'monstrous liabilities' was the only thing we could expect. I'm merely impressed by the fact that he actually managed to create something that almost makes sense and tie up some loose ends in Poirot's life. However, I say I'm conflicted, and that's because I realise that he's been given some of the most challenging adaptation tasks. Appointment with Death is the only exception, really, and I offer no apologies for that particular adaptation. Yes, it's filled with internal monologues and overheard conversations, but look at what Nick Dear managed to do with The Hollow, an intensely internal novel, or Kevin Elyot, with Five Little Pigs. Now, back to the adaptation challenge and why Andrews should be allowed at least a little leeway. The Mystery of the Blue Train is not one of Christie's best novels, and the team had already adapted the short story on which the plot is based, 'The Plymouth Express'. So changes were, indeed, necessary. Without any knowledge of Christie's novel, the adaptation works, for the most part, for a 'modern' audience. And I'm glad he took the opportunity to emphasise Poirot's increasing loneliness by the end of the episode (though I feel certain that's Suchet's doing). Taken at the Flood suffers from ITV's insistence on keeping the adaptations in the 1930s, which meant the war background was lost in Andrews' script. So the fact that it doesn't completely work isn't entirely Andrews' fault. And once again, he manages to develop Poirot's character by emphasising the hints of Catholicism in the source material (but I think we can thank (?) Suchet for that, too). The Labours of Hercules was the surprise of the bunch for me. Remember, this is a collection of twelve more or less unrelated short stories - an almost impossible task for any script writer and possibly the most difficult of all the Poirot adaptation (with the exception of The Big Four, perhaps). Yes, the Mexian stand-off in the denoument scene and the melodramatic final lines between Poirot and Marrascaud ('I shall not hide' etc) are over the top. And it's disappointing that so many of the short stories are left out. Not to mention the fact that it stretches credibility more than a little that all these people just happen to be in the same hotel (but, to be fair, so does the premise that Poirot just happens to stumble upon a series of cases, in the right order, that resemble the mythological Labours). However, as I've tried to demonstrate in my episode-by-episode review, the atmosphere and character study more than makes up for any plot niggles, in my view. To summarise, Andrews is not my favourite of the Poirot script writers. He takes too many risks and the changes tend not to work - unfortunately. But his adaptation of The Labours of Hercules manages to redeem his reputation somewhat, and I think he should be given some leeway for being handed some of the more impossible novels. Its odd. Hes my least favourite adaptor as well but I forgive him in reverse to yourself. I quite enjoyed Blue Train as on its own it quite works as a film (despite the liberties with the book).. Its also has Georgina Rylance who has to be one of the most beautiful and underused actresses (underused in the sense of being given anything decent to do) in the UK. Labours fails for me on many levels , even after the horrible writing and forced situation I could never get on with the colour grading and cinematography which just seemed depressing and a way of hiding the lack of scope and location. It almost feels like a slightly expanded one stage and set play. In truth I'm not sure any of his adaptations are good - they are just saved by the directors and cast. I'd definitely agree that his adaptations are saved, by and large, by the directors, cast, and locations. I'd also agree that Blue Train works as a film, but then again - that's mainly because of the actors they attracted and the location it was shot in. Suchet mentioned somewhere that Blue Train was his most memorable and favourite shoot, and I can certainly understand that. They all seemed to be enjoying themselves. But I don't think the script is the main reason. With Labours, I was simply surprised that it actually worked in some way. I was certain it was going to fail completely, especially when it was announced that Andrews was attached to do the script. Still, I think the adaptation works for me mainly because of the character development (Poirot) and the cinematography (which I actually liked - even if it was rather obivous that it was used mainly to cover up the low budget locationwise). So, the bottom line is, I think we can both agree that he's our least favourite adaptor. I think Erik your correct in your bottom line. Re: Labours I have just watched it again (the joys of box sets on sky - though it downloads in non HD so I may be tempted to get the blu rays (have they ever released a full set)) .. Still hate the colour palette but it does have some nice character touches which you touched upon in your episode review. I still find it a bit of a pantomime and waste of the talent available ( though to be fair thats more a directorial choice). But I do agree with you when one considers the book - which lets face it would challenge anybody to try to place it into one screenplay and have a start and finish - Its here I think Guy could have engaged the viewer slightly better as our bookend character (Katrina) is rather lightly brushed over and placed to far in the background to have the right amount of impact on first viewing .. Yes, I think I can agree that he could have done more to make the emotional impact of the Katrina storyline more engaging. But then again, the whole point of Katrina and the driver - in his adaptation - seemed to be to highlight the life Poirot could have had, but didn't, and in that sense I suppose the ending has the desired impact. (Unfortunately I don't think they've released a full bluray set yet - at least not in the UK, but there is one in Spain (which is more than a little bizarre)). Yes, I thought it was "up to that point" as well (and to be fair, he's said that about quite a few of the shoots over the years). But he mentions it again in his book, Poirot and Me, published in 2013, shortly after they had shot the final episodes. So it must still be a stand-out. I thought that "Taken at the Flood" was obviously a post-WWII novel, but if they had to set it in the 1930's. it would all have been much simpler if Gordon and Rosaleen had been honeymooning in Spain and been hit by a bomb during the Spanish Civil War. It would have taken a page right out of "Hercule Poirot's Christmas," for (SPOILERS) the real Pilar Estravados was killed in exactly the same way. That's a fair point, Chris. A reference to the Spanish Civil War would also have been more in keeping with the inclusion of historical events in earlier episodes. As much as I love most of the Poirot adaptations, I can't help but think they would have made things a lot easier for themselves if they had simply extended the timeline to the 1940s. Several of the post-war novels would obviously have worked better. As it is, though, and with the 1936 restriction in mind, I think most of the screenwriters did their best to adapt the novels. The transition just wasn't always as seamless as it could have been. We offer local, experienced Private Investigators in Miami, North and South Miami Beach, Fort Lauderdale, Hollywood, Boca Raton, Delray Beach, West Palm Beach and all surround South Florida area’s.